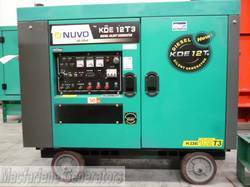 This well presented Nuvo generator Model KDE12T3 shows only 80 hours and is freshly serviced and clean. It is air cooled, wheel mounted for maneuverability, and has a central lifting hook making it easily transported for use in three phase applications where up to 10.5kVA or 15.5 Amps is required. An integral DC output rated at 8.3 Amps is another enhancement.